This 100% cacao bar with dates is also available with cacao nibs. All photography courtesy Antidote Chocolate. WHAT IT IS: Small-batch, gourmet artisan chocolate. WHY IT’S DIFFERENT: More unusual flavors and special treats. WHY WE LOVE IT: Great imagination and execution. WHERE TO BUY IT: AntidoteChoco.com, $8.95 per bar. For individual bars, visit Chocosphere.com. More of our favorite chocolates. Super Bowl Sunday or any occasion. Recipe Of The Week: Hazelnut Butter. An easy-to-make “secret weapon” that adds lots of flavor to your cooking and baking. and our most popular articles. 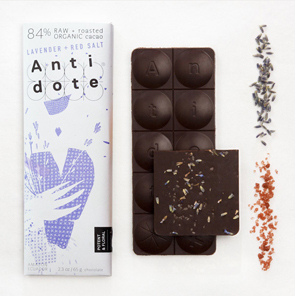 Above: An 84% cacao bar with lavender and red salt. 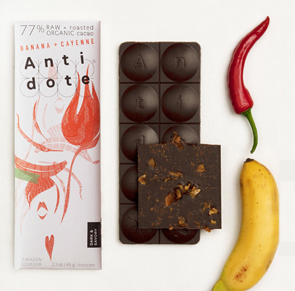 Below: A 77% cacao bar with banana and cayenne. A 77% cacao bar with hibiscus flowers and blackberries. Below, an 84% cacao bar with ginger and gooseberry. 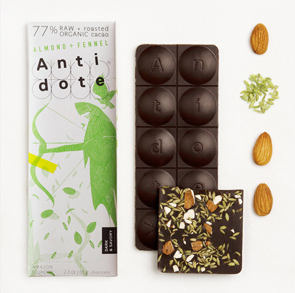 A 77% cacao bar with almond and fennel. 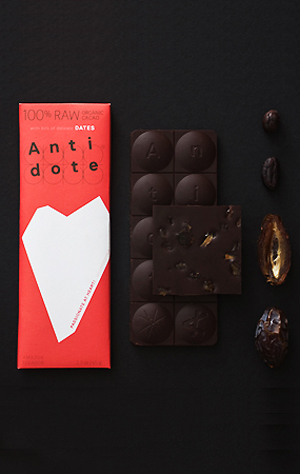 Here’s an outside-the-box chocolate bar for Valentine’s Day (or any day). 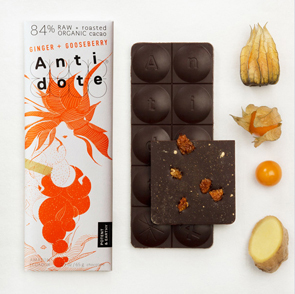 Consider giving one bar or a gift set of Antidote Chocolate. We thought it was the best product we tried at the Chocolate Show in New York City this past November. 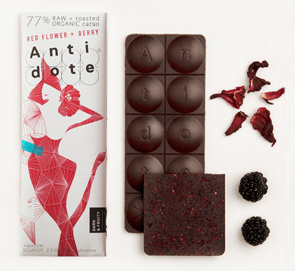 Red Thalhammer, creator of Antidote Chocolate, is not your average chocolate maker, says her bio. That’s an understatement: She’s not your average gourmet chocolate maker, either. Instead, she’s one of a very small group of chocolate innovators: chocolatiers working to expand the boundaries of chocolate as we know it. Red grew up working in her family’s restaurant and farming businesses in Austria, then studied communications design, specializing in packaging design and branding for fine foods and beverages. It’s the blend of 50% roasted cacao beans—from which conventional chocolate is made—and 50% raw cacao nibs. For added spark, a special blend of herbs and spices is variously infused into the bars. They’re the antidote to conventional chocolate bars, and a truly better-for-you chocolate bar. 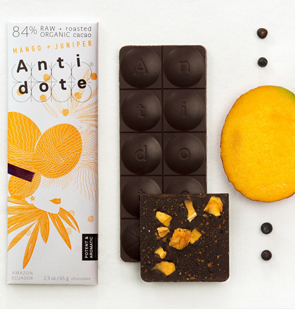 An 84% cacao bar flavored with mango and juniper berries. For several years, companies have used scientific research on the antioxidants in cacao to claim that chocolate is good for you. It is true that in lab tests—which do not roast the cacao beans like chocolate producers do—cacao is an antioxidant star. But far fewer antioxidants remain after the chocolate has been roasted, ground, conched and turned into the chocolate most consumers eat. Add to that the sugar—for example, a Hershey bar is about 30% cacao and 70% sugar—and we’re not talking any kind of health food. Those who want health benefits from their chocolate (or who just don’t like cloying sweetness) choose bars of 70% cacao or higher. It’s a good start, but the antioxidants are still largely roasted out. But what if there were a different type of chocolate bar, that retained antioxidants via raw cacao and beans that were roasted to ensure the retention of more antioxidants? Then, a chocolate bar delivers more antioxidants. What it doesn’t do is provide the sweet, simple satisfaction of conventional chocolate. This is earthy cacao for chocolate connoisseurs and healthy food fans. The bars are made in Ecuador from Arriba Nacional beans—considered among the finest cacao beans in the world. What About 100% Cacao Chocolate? What about the fat in chocolate? Good news: cocoa butter is a healthy fat. While technically classified as a saturated fat because of its chemical structure, it acts almost exactly the opposite in the human body. Composed mostly of stearic acid compounds, it has a neutral effect on cholesterol levels and is not a source of trans fat. No wonder the Swedish botanist and physician Carl Linneaus named the cacao tree Cacao theobroma: cacao, food of the gods. Check out the article index, below. 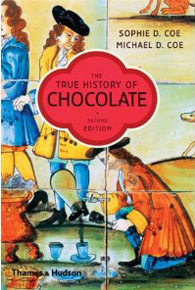 The True History Of Chocolate, by Sophie D. Coe and Michael D. Coe. This best seller is one of the seminal books on chocolate, from its wild origins in the jungles of Latin America to its evolution into one of man’s favorite foods. More information. 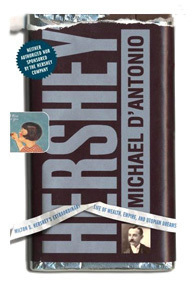 Hershey: Milton S. Hershey's Extraordinary Life of Wealth, Empire, and Utopian Dreams, by Michael D’Antonio. Barely educated, deserted by his father, his first two businesses bankrupt, Hershey went on to create an empire. More information. 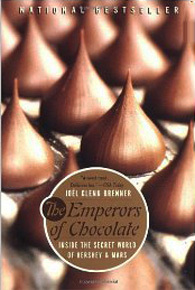 The Emperors of Chocolate: Inside the Secret World of Hershey and Mars, by Joël Glenn Brenner. Bitter legal and marketing fights, palace intrigue, personality clashes, family drama. And you thought chocolate was a sweet business! More information. Bowl Sunday or any occasion. An easy-to-make “secret weapon” that adds lots of flavor to your cooking and baking.